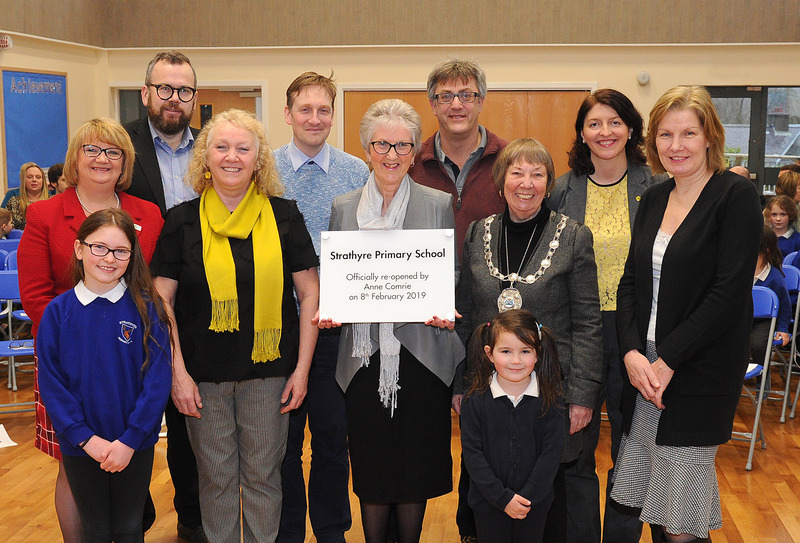 Strathyre Primary School was officially re-opened today (Feb. 8) following its £1.864million refurbishment. Anne Comrie, who was Headteacher at the school for 20 years between 1986 and 2006, cut the ribbon inside the new facility in front of staff, pupils and dignitaries, including Provost Christine Simpson. Local ward Councillors, Convener of the Children and Young People Committee, Cllr Susan McGill, and Council Officers from the Education and Infrastructure teams were also among those in attendance. Stirling Council had invested in the project to provide additional teaching space and a sport, dining and community area. Along with improving the educational environment, the extensive renovations and improvements will allow better energy efficiency and reduced operating costs in the future. It has also ended the need to transport pupils off site for physical education and seen the removal of modular accommodation. The impressive new building re-opened to the school community just before the Christmas break (Dec 18), and pupils and staff have been enjoying their brand new learning space. Headteacher Bernadette McDonald said: “Our school motto is ‘Strathyre Grows Learners’, and our new building will extend and improve our opportunities to do just that. “We now have the capacity for three teaching spaces, a dining area and a large school hall, and we will be able to offer our children many more learning opportunities. “We also plan to work in partnership with our local communities to encourage the use of the school hall as a place to meet for recreation, sport and the sharing of skills. Ex-pupil Connor Ramsay-Clapham (19) got the event underway by piping in pupils and officials into the school’s new multi-purpose hall, before the children continued the positive atmosphere by singing some songs. After current Headteacher Mrs McDonald spoke about the school’s history and the benefits of the refurbishment, former Head Mrs Comrie unveiled a plaque commemorating the occasion to huge applause. The Council’s Chief Education Officer, Kevin Kelman, brought the ceremony to a close, and then P6 pupils gave Cllrs and visitors a guided tour of the renovated school. Mrs Comrie said: “The first time I saw the refurbished school I was quite overwhelmed by the enormity of the change. “The whole building looks fantastic but the red-cedar shingles on the exterior, architecturally, is really in keeping with its environs. “It was a privilege and an honour to re-open the school and it was lovely to see the children, including some whose parents I had taught. Cllr McGill said: “This was a special day for the school community and it was a privilege to be here for its official re-opening. “We made this investment to ensure the school was transformed into a modern and fulfilling learning environment which will help pupils achieve their potential. “It was wonderful to hear how the children and staff are enjoying their new learning environment, and it was a lovely touch to have Anne Comrie, someone with so many years of service to the school community, unveil the plaque. Cllr Margaret Brisley, Vice Convener of the Children and Young People Committee, said: “These refurbishments have been completed to the highest possible standard and the new school looks superb. Note: Picture shows former Headteacher Anne Comrie (holding the plaque), alongside current Headteacher Bernadette McDonald (yellow scarf), Provost Christine Simpson, Cllr Susan McGill (far right), local ward Councillors, Stirling Council’s Chief Education Officer, Kevin Kelman (far left), and a representative from Education Scotland. Both children pictured celebrated their birthdays today - Oksana MacLennan (5) from P1, and Keely Brydie (10) from P6.